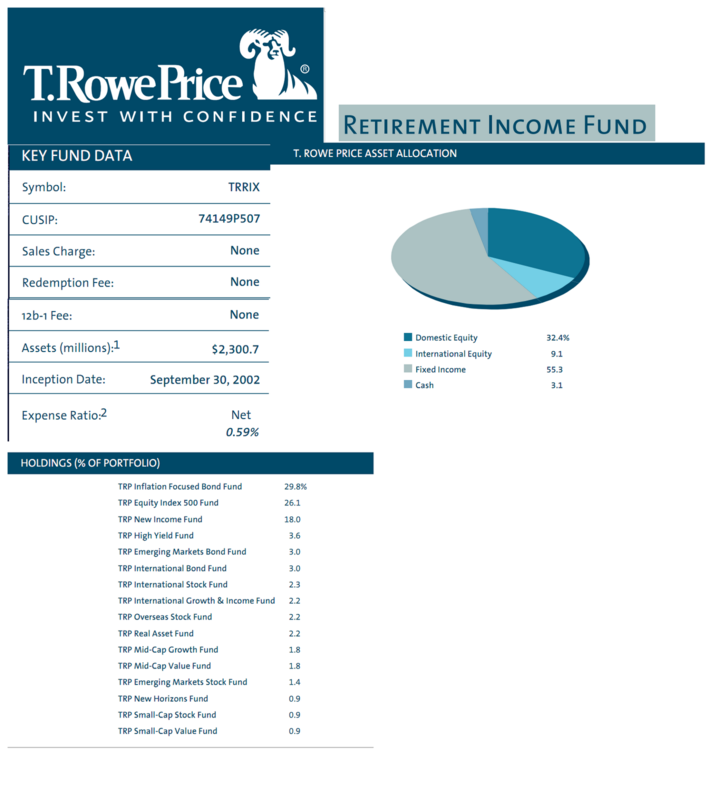 This T. Rowe Price fund’s lead manager is Jerome A. Clark. Jerome is the Vice President of T. Rowe Price Group, Inc and T. Rowe Price Associates, Inc. He has been the lead manager of this fund since its inception in September 2002. If you are interested to invest in this fund, this is a no sales load fund, meaning it has no 12b1 fee and no front-end sales load fee. The current dividend yield of this fund is 2.59%. The last dividend distributed in June 2011 is $0.04. The expense ratio of this TRRIX fund is 0.0% per year. This expense ratio is lower than the average in the category which is 0.6%. The fund also has total net assets of $ 2.42 billion. This best balanced fund has returned 15.85% over the past year and 5.47% over the past five years. The best 1-year total return was in 2009 with 22.07%. The worst 1-year total return was in 2008 with -18.39%. This best rated fund has received 4 stars rating from Morningstar. This retirement income fund has achieved 7 years in positive return and 1 year in negative return. The minimum initial investment is $2,500 for brokerage account and $1,000 for IRA account. The minimum subsequent investment for brokerage account is $100. TRRIX can be bought from 72 brokerages include T Rowe Price, Vanguard, JP Morgan, E Trade Financial, Schwab Retail and Institutional, Raymond James, Protected Investors of America, LPL SAM Eligible, etc. This top retirement fund is currently open to new retail investors and subsequent retail investments. 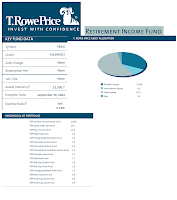 TRRIX is a No Load investor class of this T. Rowe Price Retirement Income Fund. The other classes of this fund are PARIX (Class Adv) and RRTIX (Class Retirement). As of March 2011, the asset allocation of this TRRIX fund is as follow Domestic Bond (44.8%), Domestic Stock (32.4%), Foreign Bond (10.4%), Foreign Stock (9.1%), Cash (3.1%), Preferred (0.2%) and Convertibles (0.1%). TRRIX fund has a total of 4972 holdings. The fund top holdings are T Rowe Price Inflation Focused Bond Fund (29.8%), T Rowe Price Equity Index 500 Fund (26.1%), T Rowe Price New Income (18%), T Rowe Price High-Yield (3.6%), T Rowe Price Emerging Markets Bond Fund (3.6%), T Rowe Price International Bond Fund (3%), T Rowe Price International Stock Fund (3%), T Rowe Price International Growth & Income Fund (2.3%), T Rowe Price Overseas Stock Fund, and T Rowe Price Real Assets Fund (2.2%).